New Chrysoprase and White Sapphire Sterling Silver Ring! 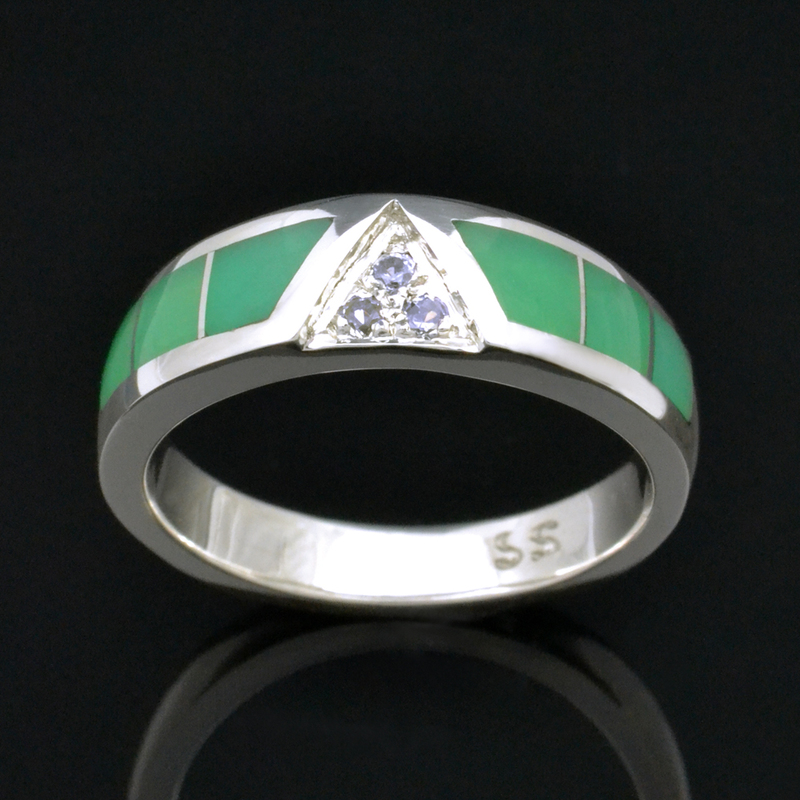 We just finished this beautiful chrysoprase inlay ring with white sapphires set in sterling silver. Three pieces of apple green chrysoprase are inlaid in each side of this ring with 3 pave` set white sapphires in the center. The sparkling white sapphires total .09cts. and are in a triangle cluster. The ring is 5.6mm wide at the top and 3.2mm wide at the bottom (shank). 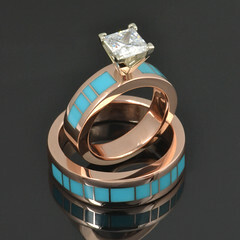 The handmade chrysoprase ring in the photo is a size 7 1/4. All other sizes will be special orders and will take about 3 to 4 weeks to complete. 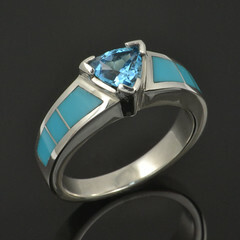 You may customize this ring by substituting other inlay materials or other gemstones in place of the white sapphires. Additional charges will apply if your choices are an upgrade. This ring style is a popular choice for those looking for a unique and unusual wedding ring. Chrysoprase is a rare form of chalcedony or quartz. Chrysoprase ranges from light to dark green but is most sought after in its striking apple green color. Chrysoprase is rare due to the fact that it is cryptocrystalline, meaning that instead of being formed by large six sided crystals, the size of the crystals are extremely small and cannot be seen as distinct particles under normal magnification. Chrysoprase has a hardness of 6.5 to 7 on the Moh’s scale and is in the same stone family as agate, carnelian, and onyx. The best known sources of chrysoprase are Queensland Australia, Germany, Poland, Russia, Arizona, California, and Brazil. To purchase this ring visit our Etsy shop at http://www.etsy.com/listing/85035393/chrysoprase-ring-with-white-sapphires-in. 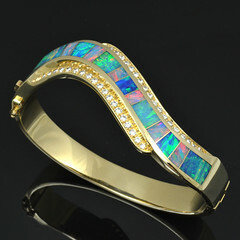 See all our silver jewelry designs at www.HilemanSilverJewelry and our gold Australian opal designs at www.AustralianOpalJewelry.com. This entry was posted in New Designs, Wedding Rings, White Sapphire Jewelry and tagged alternative wedding, apple green, chrysoprase gem information, chrysoprase inlay, chrysoprase ring, green stone, handmade, Hileman, sterling silver ring, wedding ring, white sapphire ring. Bookmark the permalink. Wonderful sterling silver gemstone ring………..